If you're in Barcelona for a long holiday, you should know that there are many interesting and fun places nearby that you can visit as well. Around an hour away, Catalonia offers many sights that are perfect for a day or a weekend trip, and of very different kinds! Barcelona's privileged location between the Mediterranean Sea and the Catalan Mediterranean Mountain Range provides the surroundings of the city with both wonderful mountain and sea sights. Here you have the best options to go on a trip from Barcelona and discover the beautiful region of Catalonia! The first trip of our list is perfect for the whole family. Port Aventura is the most famous amusement park in Spain, and it is just a 75-minute train trip away from Barcelona! 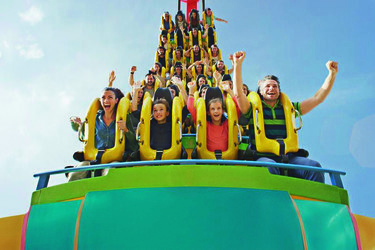 Located near the holiday city of Salou, next to Tarragona, Port Aventura World is a theme park with five different 'worlds' and a ton on extremely fun attractions that will surely give you an unforgettable adrenaline rush! You can enjoy Port Aventura Park, the aquatic park located right next to it, Costa Caribe Aquatic Park and the new park Ferrari Land. Your kids aren't likely to forget such a day! One of the most unique mountains you will ever see is located only around 50 kilometres from Barcelona. The mountain of Montserrat is an astounding rocky range with multiple peaks, which are shaped as fingers (in fact, 'montserrat' means 'serrated mountain' in Catalan). 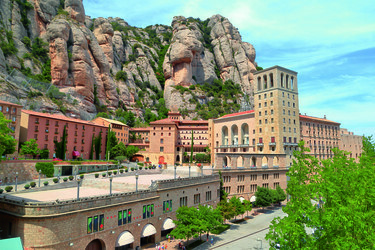 It hosts a Benedictine abbey and a museum of Catalan art, as well as the famous Virgin of Montserrat, one of the few black Madonnas of Europe. You can arrive to Montserrat by taking a train from Barcelona and then a rack railway, but it is a beautiful hike to the top. The region of Catalonia has many different landscapes to offer. You can find golden beaches in the city of Barcelona and its surroundings, as well as in the south, but if you go to Costa Brava, in the north, towards the city of Girona and its surroundings, you will find a whole different thing: Rocks, cliffs and stony shores, beautiful beaches made of rocks, reddish thick sands and fierce tides worth seeing. 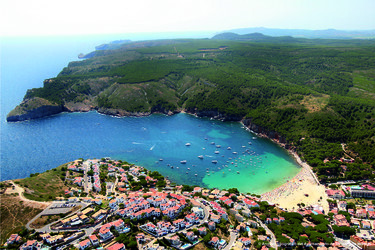 In fact, 'Costa Brava' means 'Wild Coast'! You will love the hard terrain and beautiful cliffs, as well as the rocky bays. It makes for a beautiful day trip! Barcelona is the most famous city of Catalonia - but it sure isn't the only one worth visiting! 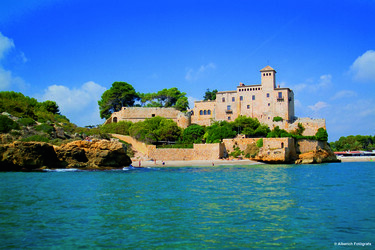 Around an hour away you will find Tarragona, the old Roman Capital of Tarraco. As such, you will find wonderful Roman ruins, which were declared a World Heritage Site by the UNESCO. Those include the impressive Amphitheatre, Les Ferreres Aqueduct and many others. Tarragona is located in the Costa Daurada ('The Golden Coast'), which means that you will be able to enjoy yourself in some beautiful beaches as well. If you want to go on a day trip during your stay in Barcelona but you don't want to go too far, we have the perfect option for you: Sitges, a beautiful seaside town where you will be able to lie on a beautiful golden beach. The town beaches are usually quite crowded, but you can hike for a little white to hidden and private bays. Don't forget to put the cherry on top with a walk through Sitges' sloped streets and its beautiful church by the sea. You will go back to Barcelona with a smile on your face!